Definition at line 60 of file QweakSimHDC_WirePlaneSD.hh. Definition at line 47 of file QweakSimHDC_WirePlaneSD.cc. 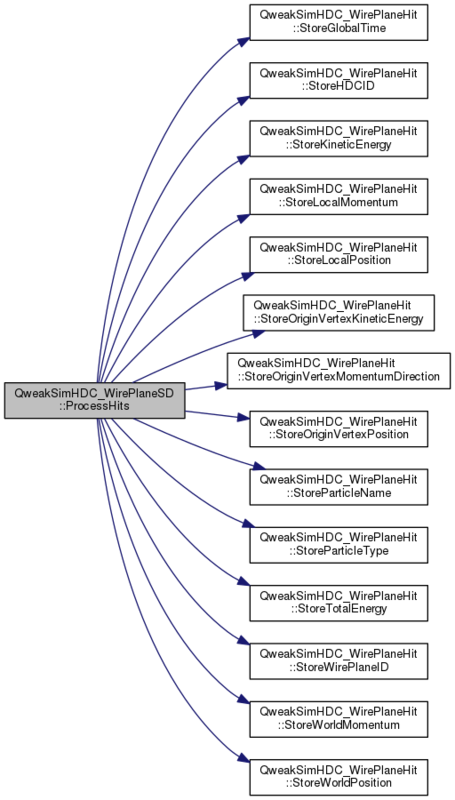 Definition at line 59 of file QweakSimHDC_WirePlaneSD.cc. Definition at line 243 of file QweakSimHDC_WirePlaneSD.cc. Definition at line 67 of file QweakSimHDC_WirePlaneSD.cc. Definition at line 82 of file QweakSimHDC_WirePlaneSD.cc. References hitsCollection, QweakSimHDC_WirePlaneHit::StoreGlobalTime(), QweakSimHDC_WirePlaneHit::StoreHDCID(), QweakSimHDC_WirePlaneHit::StoreKineticEnergy(), QweakSimHDC_WirePlaneHit::StoreLocalMomentum(), QweakSimHDC_WirePlaneHit::StoreLocalPosition(), QweakSimHDC_WirePlaneHit::StoreOriginVertexKineticEnergy(), QweakSimHDC_WirePlaneHit::StoreOriginVertexMomentumDirection(), QweakSimHDC_WirePlaneHit::StoreOriginVertexPosition(), QweakSimHDC_WirePlaneHit::StoreParticleName(), QweakSimHDC_WirePlaneHit::StoreParticleType(), QweakSimHDC_WirePlaneHit::StoreTotalEnergy(), QweakSimHDC_WirePlaneHit::StoreWirePlaneID(), QweakSimHDC_WirePlaneHit::StoreWorldMomentum(), and QweakSimHDC_WirePlaneHit::StoreWorldPosition(). Handles hits of the HDC wire planes. Definition at line 74 of file QweakSimHDC_WirePlaneSD.hh. Referenced by Initialize(), and QweakSimHDC_WirePlaneSD(). Definition at line 72 of file QweakSimHDC_WirePlaneSD.hh. Referenced by Initialize(), and ProcessHits().